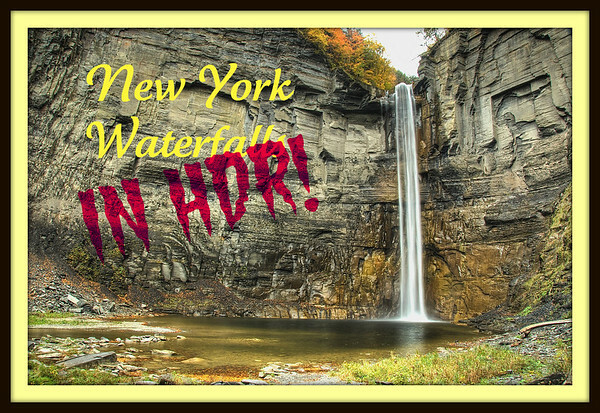 New York Waterfalls in HDR Photo Essay. I did warn you about seeing more HDR images here. My recent Waterfall Safari gave me an opportunity to create some HDR images I decided to share with you as a Photo Essay. Click here or the title image above to see it. I hope you like it. This entry was posted in Nature, Photo Essay, Travel, Weekly View and tagged gorge, hdr, high dynamic range, new york, Photography, robert h treman, state park, taughannock falls, water, waterfall. Bookmark the permalink. Your results are really fine, Scott. You’ve found a great solution for those sun-dappled woods-in-autumn shots. What a lovely walk you took us on. You take us on a lot of your walks and am glad to return the favor, Gerry. 🙂 When faced with extreme ranges in light, HDR is a good solution. Those gallery shots are outstanding, Scott! Absolutely beautiful! Thanks, Terry! I am happy with the results and will use this technique in the future when faced with tough lighting situations. Absolutely beautiful images. I’m curious about the polarizer filter that you used here, is this something that’s needed for outdoor photography? I’ve never used a filter before, and heard from a friend that I need one, but I’m not sure what kind or when to use it. Thanks Scott, very informative post and I’ve a better understanding of what HDR does now. Thanks, Anna! Having seen yours and Preston’s landscapes over the past year, I had a good idea on how to approach these parks. Great set of photos on your SmugMug account. I used to only shoot 3 exposures when my histogram indicated too much of a range was needed, now I find my self shooting 3 exposures every time I set my tripod up. Isn’t digital great! Put you in my BlogRoll under HDR work. Thanks for the comment and blogroll add, Mike! Nice work. Just found your site via wordpress tag.